What would happen if the worlds of Toy Story 3 and Coco collided? 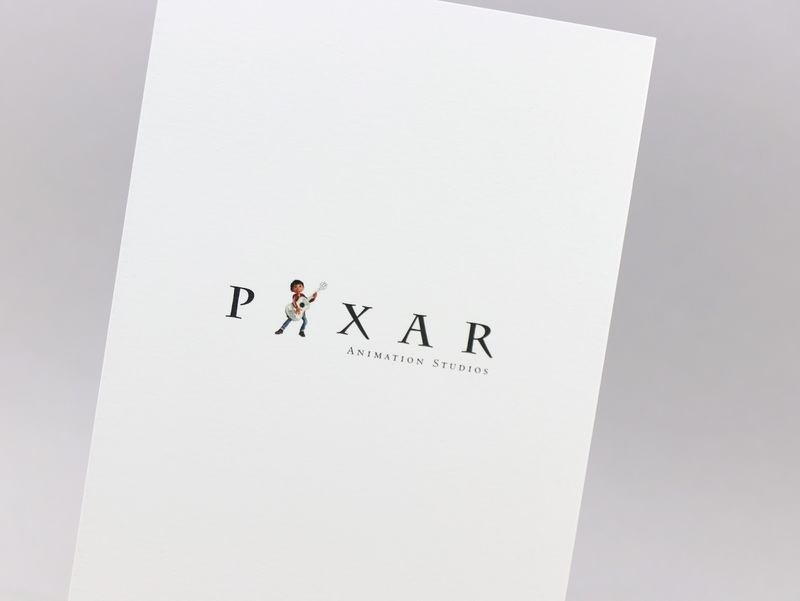 You would get this brilliant Pixar crossover art piece by the great Jerrod Maruyama! 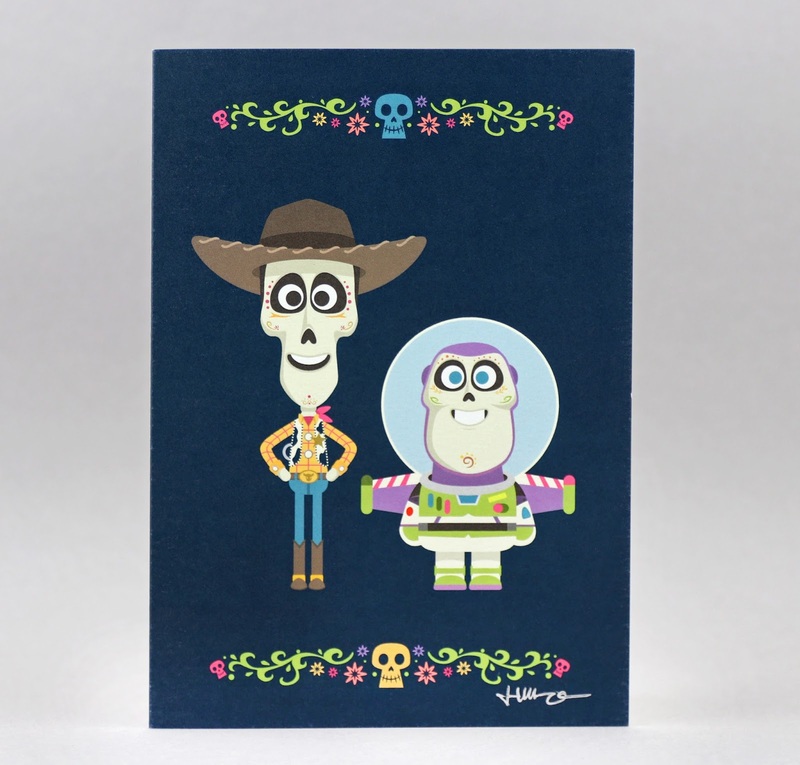 This brand new print (well, greeting card) is currently available exclusively at the Pixar Studio Store in Emeryville, CA and brings together both of director Lee Unkrich's masterpieces. On the front you have the hilarious and fantastically stylized Buzz and Woody in the style of Coco/Dia de los Muertos skeletons (along with some other colorful "Day of the Dead" skulls and floral accents) and on the back you have Miguel strumming his guitar in place of the Pixar logo's "I". The inside of the card is blank to accommodate your hand written messages. I'm super thankful to Jerrod for sending this on over—and even signing it! He has been an amazing friend and I can't support his art enough. Jerrod consistently puts out some of the best Disney freelance art out there which continues to blow me a way and leaves me wanting more each time. If you're unfamiliar with his work, check out his blog HERE and be sure to follow him all over social media on Twitter, Instagram and Facebook. He's literally one of the nicest and most humble artists you'll come across in the Disney community, so don't hesitate to reach out and say hello. As a massive Toy Story fan and one who's greatly anticipating the release of Coco (which actually opens in the US exactly ONE MONTH from today!! ), I couldn't have asked for a cooler mashup right now. Plus —we're close to Halloween as well and this makes for a very festive display piece for my desk currently. Thank you again Jerrod! What are your thoughts? If you're lucky enough to get to the Pixar Studio Store, would you plan on picking this up there? Let me know your overall impressions in the comments below! Final note: This design is also available to purchase on a Pixar Studio Store exclusive t-shirt, which is awesome as well! Check that out right HERE.